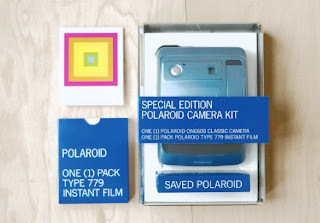 Just a day after I had the fleeting thought of finally switching my film SLR for a digital one I learned about The Impossible Project, which "aims to re-start production of analog instant film for vintage Polaroid cameras in 2010." When Polaroid stopped producing instant film last year, the Project stepped right in and purchased one of its factories in Holland. Wow! That brings back some memories. I wonder whatever happened to our old Polaroid camera. We used to have Polaroid scavenger hunts when we were kids. I think these pictures, printed instantly, are fantastically classic. I would love to be able to hang up some polaroids on the fridge, and put some in scrapbooks. They're just perfectly classic. Happy Friday, friend. I think that's such a fun idea! It's made me sad over the past few years how digital (convenient though it is) has crowded out all other forms of picture-taking. kay, I don't even remember ever having one in our house growing up. tooj, I know! I love how they look and the instant gratification of having a print in your hand. And I remember how much I liked holding one by the edges, shaking it and watching the picture slowly develop. kelley, and mine pretty much consists of regular 35 mm film. kay, same here! I actually worked on a long article for a semester in grad school about the fate of film and old-school die-hards who refuse to switch over. I always liked watching it develop too. Being in a photo-happy family, my parents had an SX-70 camera - the film was really expensive so they were really selective about the pictures they took. I think they still have the camera. They retired it when the digital era dawned with its own form of (much cheaper) instant gratification.